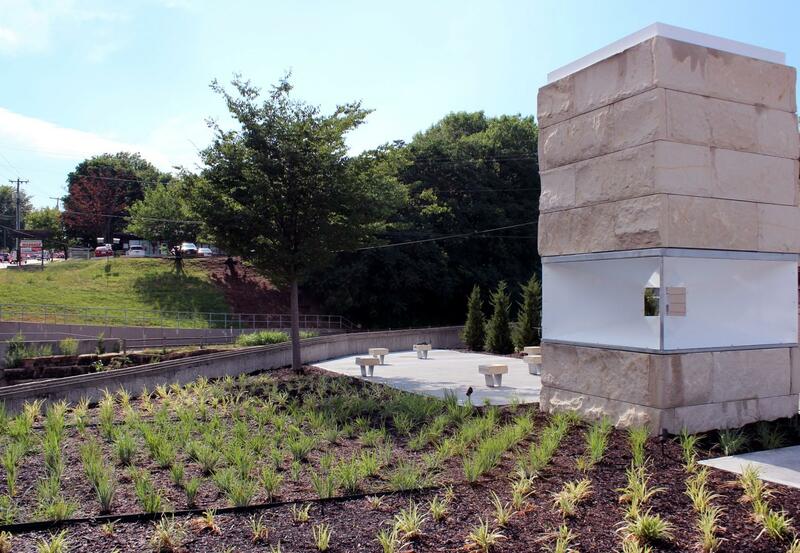 'Still Time,' a limestone and steel tower in a surrounding park, is envisioned as a gathering place. Merriam is one of Johnson County’s oldest communities. Over the last decade, the city has made a big investment in capital improvements — an estimated $60-$80 million — to upgrade streets. But city administrator Phil Lammers says something was missing. "One thing that we were not doing along the way was an effort for really place-making, bringing an identity of Merriam to those neighborhoods," he says. 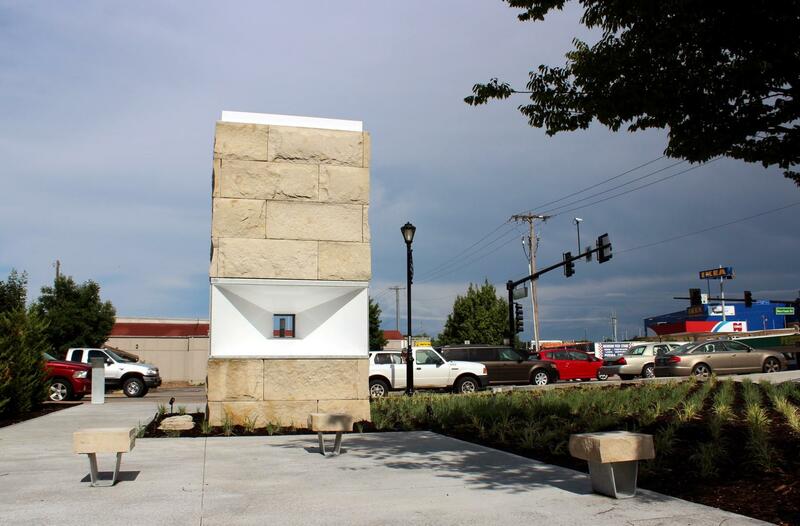 In 2015, as an effort to connect more to what defines Merriam as a place, the City Council approved funding for a placemaking program: $500,000 over five years for public art downtown. "Five different locations, and five different artists over a five-year period," explains Lammers. Unlike other arts initiatives around the metro, this wasn't a percent-for-art program; it was money designated from the general fund. The first site: a narrow pocket park near the busy intersection of Johnson Drive and Merriam Drive, just down the street from I-35 and IKEA. Lammers says this corner was ripe for a makeover. "In the summertime, you’ve got a hot, gritty, windy loud intersection. And in the wintertime, you've got a cold, gritty, windy, loud intersection. And we need to do something about that." Paul Rudy, a sound artist and composition professor at the UMKC Conservatory of Music and Dance, collaborated on the project with a team from DRAW Architecture and Urban Design, including principal Dan Maginn. "This is just the kind of project I’ve been involved with for almost 30 years," says Maginn. "It lines up exactly with what I like to do, which is to make great places." A view of Turkey Creek from the site of 'Still Time.' 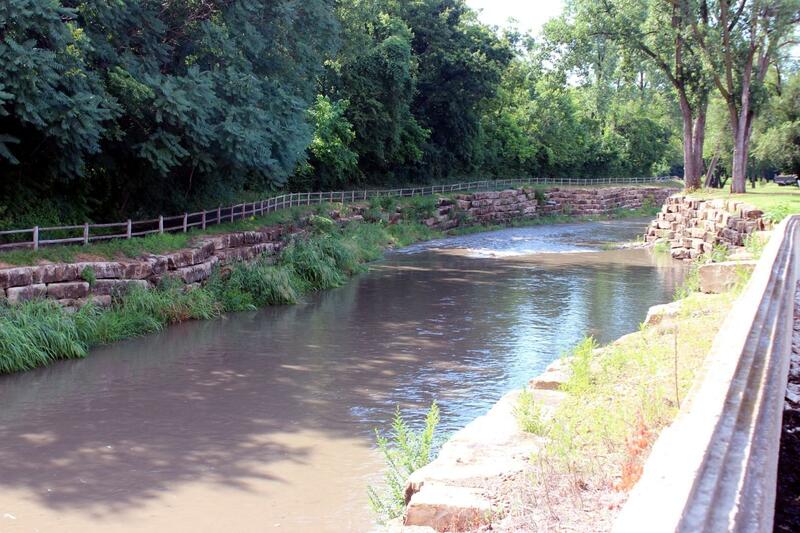 A four-mile paved trail runs from 75th to Antioch Road along the creek. The intersection, says Maginn, is a place where people are in a hurry. But he says the design team chose not to focus on the traffic. Instead, they tapped into something older: the serenity of nearby Turkey Creek, lined with blocks of limestone, the sense of quiet, and the occasional gust of wind. Now at the center of the site is a 16-foot tall limestone tower with a wind chime. It's called Still Time. "We kind of had a sense that it could be this combination of lightness and heaviness with a lot of stone, kind of resting on this cube of wind," says Maginn. 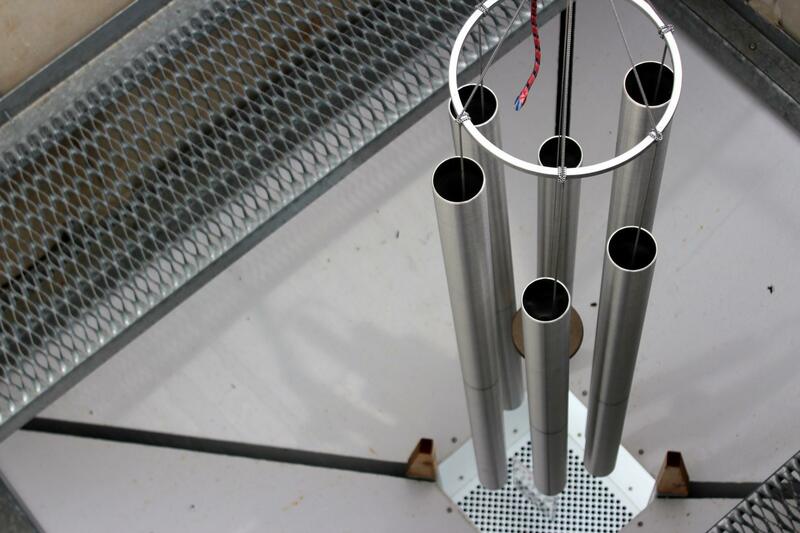 "And that industrial pipes could turn into an industrial-scale wind chime." "It’s one of the most interesting, bizarre, weird gigs I’ve ever had," says Paul Rudy, who was tasked with identifying the notes for the chimes. "It’s like six notes, we don’t know how to find what they are." Rudy recorded inside the tower at different times of day, and analyzed the frequencies. But it was when he sang, or chanted, that he says he discovered the right tones — the ones that resonated. "What I found was my voice was enough," Rudy says. "What enabled me to tune the chimes was singing inside the stone chamber," he says with a laugh. A large-scale wind chime is housed inside the 16-foot limestone tower. Very few will now go inside the stone chamber — it’s off-limits. But, on a recent afternoon, the air was still. Architect Maginn led the way, up a ladder, to see the wind chime up close. Inside the tower, the six pipes are connected to a wind target that looks like a license plate; it's a nod to the downtown muffler and auto shops. This piece of metal catches the wind, and the striker hits the chimes. It’s visible from the outside, in the center of the tower, but the chimes are not. Maginn says that adds a sense of mystery. "If it’s a windy day, you’ll hear some deep tones that kind of resonate from the chamber," says Maginn. "If it’s not very windy, they’ll be pretty muted. If there’s no wind at all, there’s no chime sound, and that’s ok."
Maginn says they hope someone walking by might consider slowing down, sitting on one of the limestone blocks in the park, and stopping for a moment — in this place — to listen. A celebration of the launch of the first of the new placemaking projects in Merriam, Kansas, takes place on July 6, at the Merriam Marketplace, 5740 Merriam Drive, from 4 p.m. to 7 p.m. Food trucks will be on site, and the Wednesday Farmers' Market. A ribbon cutting is scheduled for 6 p.m. at the corner of Merriam Drive and Johnson Drive.